Staying in good health is everybody's desire. Health is our most important asset, and protecting it in every way we can is our responsibility. 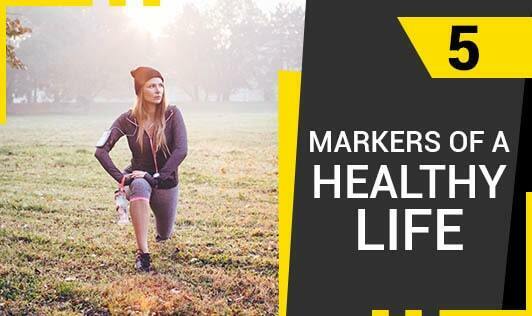 Here are a few simple markers of good health that can make sure your health is in good shape. Your Weight: If you or your loved one has unexplained weight gain in a very short time or is having trouble losing weight despite best efforts at eating well and staying fit, there can be some medical causes like hypothyroidism, polycystic ovarian disease, depression and many more. Maintaining a healthy weight is important for overall health and can help you prevent and control many diseases and conditions. Unexplained and drastic weight loss would make some happy, but you must question it as it could even be a warning sign of cancer. Skin and Hair: Skin and hair are organs that do special jobs that support life. Skin protects your inside organs from injury, bacteria, and viruses. Skin, hair, and sweat glands help control body temperature. There are different ways by which your skin changes as you age. Keep a track on the skin changes. Any unexpected moles, marks, lesions or lumps increasing in size can be alarming sign for skin cancer. Teeth: Dental health is more than just about pretty white teeth. Gums and teeth reveal a lot about your health. Gum disease has been linked to life-threatening diseases such as oral cancer, heart diseases, diabetes, digestive and respiratory ailments. Healthy smile can help ensure a healthy life for you and your family. Urine: The color of your urine can be a clue to status of your health. More than 100 different tests can be done on urine other than pregnancy. Abnormally colored urine may be cloudy, dark, or blood-colored. Remember, food and any medication can lead to discoloration of the urine. If you have any concerns about what could be causing your urine color to change, please consult with your doctor. Healthy Home: We work hard to make our house a beautiful place to be,but even super-tidy homes can harbor germs. You're more likely to get sick from a germ in your own house than from any other source. Your home is the perfect breeding ground for dust mites, allergens, toxins and germs. Don't forget to also check your home if you are suffering from asthma or any kind of respiratory illness. So the next time you have any questions about your health, make sure these 5 markers have been checked!